The underground public toilet in Russell Street was built in 1902 and designed by the Melbourne City Surveyor Adrien C Mountain. It included facilities for men and women, and was both the first underground public toilet built in Melbourne, and the first public toilet for women. It was one of a number of underground public toilets built in Melbourne in the early twentieth century in response to increasing demand for public toilet facilities in the city that were both sanitary and discreet. Until then there were no public toilets for women, and very few for men. The first public toilet, a urinal for men only, had been built in 1859, following the opening of the Yan Yean water supply in 1858. But such street level toilets were regarded as indecently public, and without an underground sewerage system, the waste discharged directly into the gutters. Underground toilets, which removed toilets from public view and so satisfied contemporary perceptions of decency, had already been built in Scotland, England and Sydney. Such facilities were finally made possible in Melbourne with the establishment in December 1891 of the Melbourne & Metropolitan Board of Works, responsible for building and maintaining an underground sewerage system. The Russell Street toilet was built in the same year as women gained the right to vote and sit in Federal Parliament, following a concerted campaign by feminist groups and prominent individuals, such as the political and social activist Vida Goldstein. It was the first of eleven underground public toilets built by the Melbourne City Council by 1939. The toilet was decommissioned and capped in January 1994, and the sculpture A History Apparatus - Vessel, Craft and Beacon, by Chris Reynolds (1993), was placed on the site. 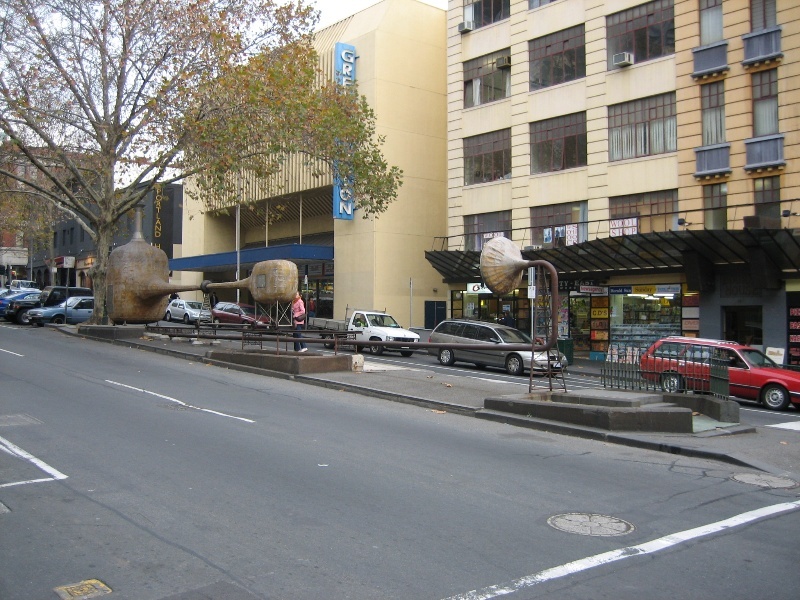 The Russell Street underground public toilet is located in the middle of Russell Street south of the intersection with Bourke Street. It had two sections: the southern end for men, and a slightly smaller area for women to the north, with separate bluestone stairs at each end. Below ground it had brick walls resting on a concrete base, and electricity was laid on, allowing for lighting and for ventilation by electric fans. The walls were lined with enamelled tiles made by the Mitcham Brick and Tile Company, the floor was paved with Maw's patent tiles and prismatic glass was used in the roof. The women's toilet had four closets, two wash basins, a store room and attendant's room; the men's three closets, eight Doulton urinals, two wash basins, an attendant's space and a store room. Towels, soap, brushes and toilet paper were provided and the charge was one penny. The female section was extended to the north in c1933, and new stairways built at each end of the new section. In the 1930s and 1960s the conveniences were remodelled and new fittings added (including railings, fan housing, attendants' rooms, brick piers, basins, tiling, floor, pipe rails, rendering of the roof). It is thought that no original internal fittings survive. The toilets have been filled with sand and the stair entrances capped with concrete slabs. The present condition of the interior is therefore impossible to determine, though it is thought to be intact. 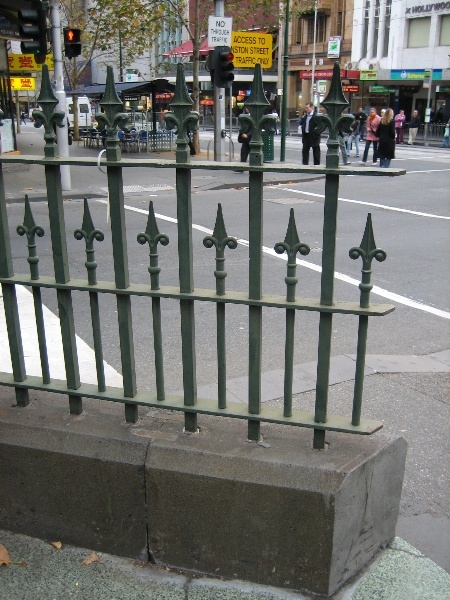 All that remains at street level are the bluestone bases of the railings surrounding the original three stairways and a short section of original railing. The original prismatic pavement lights no longer exist. The underground public toilet in Russell Street is of historical and architectural significance to the state of Victoria. The underground public toilet in Russell Street has historical significance as the first underground public toilet, and the first public toilet for women, in Victoria; as the state's oldest extant public toilet; and as Australia's oldest known surviving public toilet. It has historical significance for its association with issues of gender equality and with the political and social agenda of the first-wave feminists in Victoria. It has historical significance as a reflection of contemporary reforms in public health, of municipal responsibility for the provision of such public facilities, and of an important era of sanitary, technological and social reform in the early twentieth century. It is associated with a major engineering achievement, the development of Melbourne's underground drainage and sewerage system, and the advances in sanitation and public health made possible, following the establishment of the Melbourne Metropolitan Board of Works. It has historical significance as a reflection of attitudes to public decency in the early twentieth century. The underground toilet in Russell Street is of architectural significance as an early example of an unusual building type, and of early twentieth century civic design. Although the interiors have been altered the remaining railings and cast iron columns are of interest as examples of street furniture of the period. 1. All the building marked B1 on Diagram Number 2108 held by the Executive Director. This includes the stone kerbing, the cast iron post, the section of iron railing and the underground area. 2. All the land marked L1 on Diagram Number 2108 held by the Executive Director. Until the latter part of the nineteenth century very limited public toilet facilities were available in Melbourne. Before 1859 public toilets were only available in hotels, and men often needed to relieve themselves in the city's laneways. Women had greater difficulties, as it was not considered respectable for them to enter hotels. Public urination was a significant problem in the vicinity of restaurants or theatres, the Bourke Street East theatre precinct being particularly notorious. The local Board of Health had noted in 1856 that the lack of public toilets needed to be resolved, and with the opening of the Yan Yean water supply in 1858 the necessary infrastructure began to be put in place. The first urinals were placed directly over gutters, and the waste washed into the Yarra. Melbourne's first public toilet was built by the Melbourne City Council on the pavement in Bourke Street near Elizabeth Street in April 1859 (Argus, 14 April 1859). No public facilities were available at that time for women. With developments in sanitation in other Australian cities and throughout Europe there was soon pressure to improve facilities in Melbourne. By 1888 Adelaide had a full sewage system in operation and Sydney's system was well on the way. In December 1891 the Melbourne Metropolitan Board of Works (MMBW) was established, with responsibility for establishing sewerage services to the City of Melbourne. By 1879 however there were only a few public urinals left in the city, due to the numerous complaints received by the MCC, reflecting current concerns for public health as well as changing ideas of privacy. The solution was to move public toilets underground, out of public view. The Australian Ironmonger had discussed the underground conveniences in London, and said that they 'offer as efficient a solution of the problem as it is possible to conceive'. This publication highlighted the need for an underground sewerage system in Melbourne, concluding that 'till then the present showy structures must be endured'. The stench in the back lanes continued to be one of the ubiquitous smells of nineteenth century Melbourne. The Melbourne Town Clerk and City Surveyor had obtained details of underground toilets in Aberdeen, London, Leeds and Bournemouth. When in 1895 he was sent the plans of the underground toilets in Aberdeen, the correspondent, the Hon Edward Langton, described Melbourne's above ground urinals as 'relics of a barbarous age'. There was an acceptance that underground toilets were needed in the city: Sydney had established underground conveniences by 1888, but Melbourne had to wait until the MMBW could provide the necessary infrastructure. The first underground public toilet was opened in Russell Street just south of Bourke Street on 23 June 1902. It was designed by Adrian C Mountain, the Melbourne City Surveyor. It included facilities for both men and women, and was both the first underground public toilet and the first public toilet for women in Melbourne. Towels, soap, brushes and toilet paper were provided and the charge was one penny. Until then Melbourne had no public toilets for women, who had to make do with a few semi-private toilets at the railway station, markets and department stores, and the public facilities were only built following a sustained campaign. The Russell Street facility was opened in the same year that women gained the right to vote and sit in Federal Parliament, and reflects the increased involvement by women in social and political life, and the movement of women from the private to the public sphere of city life. In 1887 the Central Board of Health had suggested that there was a need for facilities for women in the city. In 1899 the Women's Political and Social Crusade (WPSC) petitioned the MCC and in the following year the MCC resolved to provide female sanitary conveniences in the city, but were slow to take action. Throughout 1901 both the Australian Health Society and the Women's Health Society wrote to the MCC. Mrs Catherine Rickarby was perhaps the most persistent campaigner. In January 1900 she wrote that 'thousands of women and children suffer in their visits to the city', whilst the men are 'lavishly provided for everywhere publicly and privately'; in December 1900 she wrote 'I have been calling attention to this subject for years, and no notice is taken, but men's wants are attended to without being asked for'. The involvement of the WPSC demonstrates close links between the call for more underground public toilets and women's suffrage. Vida Goldstein was the President of the WPSC and one of Victoria's most prominent first wave feminists who stood as an independent for the Senate in 1903. The Russell Street convenience has been altered several times since 1902. A wooden shelter covering the women's toilet was removed in 1923 and replaced by iron railing. In 1934, 1962 and 1967 the conveniences were remodelled and new fittings supplied (including railings, fan housing, attendant's room, brick piers, basins, tiling, floor, pipe rails, rendering of roof). The prismatic pavement lights have also been removed. The Russell Street underground public toilet was the first of a number of such conveniences built by World War II by the City of Melbourne. A second underground public toilet for men was built in 1905 in Queen Street at the intersection with Collins Street. There was widespread opposition to this, as it was situated at the centre of Melbourne's business district, demonstrating that even when located underground, public toilets continued to challenge notions of public respectability in the early twentieth century. The council defended the central location of the toilets, arguing that this was where such facilities were most needed. In 1907 a second underground toilet for women was opened, and the third for men, in Elizabeth Street opposite the Victoria Market. The fourth underground toilet for men was built at the corner of Swanston and Little Collins Streets in 1909 (removed c1960); a men's in Elizabeth Street outside the GPO, was completed in 1910 (a women's was only added here in c1927); a women's in Collins Street beneath the Town Hall in 1914 (a men's was added c1960); and a men's in Flinders Street opposite the end of Elizabeth Street, in 1918. By 1911 then there were five underground toilets in Melbourne (Russell Street, Queen Street, Victoria Market, Swanston Street, GPO) three of which were for men only. Several more were built by the City of Melbourne in the inter-war period: in Carpentaria Place (now Gordon Reserve), East Melbourne, c1924 (MCC plans from this year are labelled 'Proposed Women's Under-Ground Conveniences'); at the corner of King and Hawke Streets, North Melbourne (now covered) (designed 1938); at the corner of Faraday and Lygon Streets, Carlton (designed 1939); and in Parliament Place, East Melbourne (1939, now demolished). All of these except the one in Parliament Place had a similar above ground form, with the stair entrances enclosed by iron railings and gates, and a cast iron sign post. After World War II very few underground toilets were built. While they were originally built in deference to contemporary standards of decency, which regarded underground toilets as more private and respectable than those in public view, modern users have different standards of public decency, and consider that being out of sight is less safe. The Russell Street toilet was decommissioned and capped in January 1994, and Chris Reynold's sculpture The History Apparatus - Vessel, Craft and Beacon (1993) was placed over the site. The Russell Street underground public toilet reflects an important era of technological and social change in Victoria. Underground public toilets were made possible by the creation of the MMBW in 1890 and the development of an underground water and sewerage system in Melbourne, a major advance in sanitation and public health in the state. This first public toilet for women in Victoria was built in the same year as women achieved the right to vote in Australia, following a sustained campaign by feminist groups. The construction of public toilet facilities for women in the city, which acknowledged that women were not necessarily confined to the home, was also a concern of feminists and was only achieved following action by such groups as the Women's Political and Social Crusade (WPSC), and of individuals such as Vida Goldstein and Catherine Rickarby. The underground public toilet in Russell Street was the first public toilet for women, and the first underground public toilet, in Victoria. It is the state's oldest extant public toilet, and Australia's oldest known surviving public toilet. The underground public toilet in Elizabeth Street is one of a group of eleven such facilities built by the Melbourne City Council between 1902 and 1939. All have similar features, with stairs surrounded by a wrought iron railing and gate leading down to an underground convenience. They are early examples of an unusual building type, and of early twentieth century civic design. 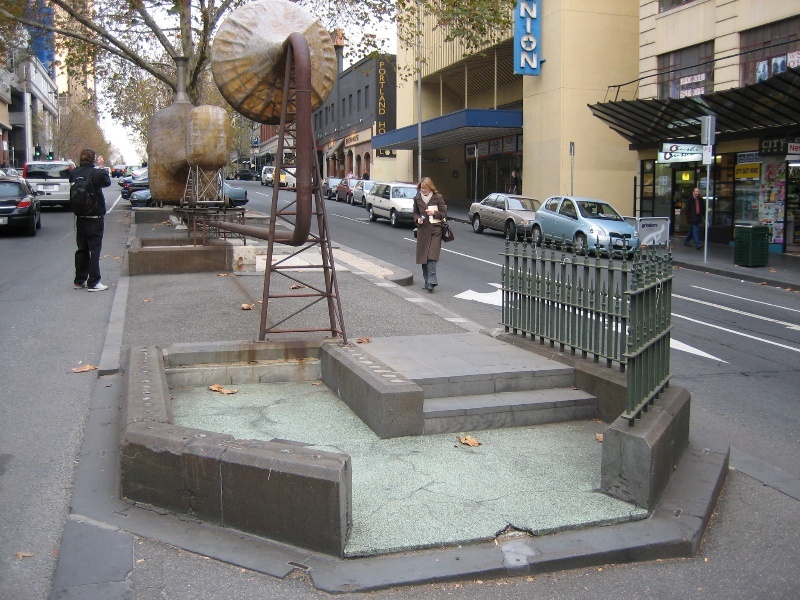 The Russell Street underground public toilet is directly associated with a major advance in sanitation and public health in Victoria: the development of proper systems for water supply, drainage and sewerage, made possible by the creation of the MMBW in 1890. The Russell Street underground public toilets demonstrate important changes in ideas of acceptable public behaviour and perceptions of public decency during the twentieth century. The ground level public urinals erected during the nineteenth century were considered too public and undignified, and had been the subject of public complaints: underground facilities were seen as a partial solution to this problem. Public toilets for women demonstrate the changing status of women and changing ideas of women's role in society in the early twentieth century. Public facilities such as these gave women a new freedom to move, work and socialise in the public sphere. Built in 1902, this is Victoria's oldest public toilet. It was the first public toilet for women and the first underground public toilet in the state, and reflects an important era of sanitary and technological reform. 1. All alterations are to be planned and carried out in a manner which prevents damage to the fabric of the registered place. 2. Should it become apparent during further inspection or the carrying out of alterations that originally or previously hidden or inaccessible details of the place are revealed which relate to the significance of the place, then the exemption covering such alteration shall cease and the Executive Director shall be notified as soon as possible. 3. If there is a conservation policy and plan approved by the Executive Director, all works will be in accordance with it. The purpose of the Permit Policy is to assist when considering or making decisions regarding works to the place. It is recommended that any proposed works be discussed with an officer of Heritage Victoria prior to them being undertaken or a permit is applied for. Discussing any proposed works will assist in answering any questions the owner may have and aid any decisions regarding works to the place. It is recommended that a Conservation Management Plan is undertaken to assist with the future management of the cultural significance of the place. The significance of the place lies in its uniqueness as the first underground public toilet, and the first public toilet for women, in Victoria. 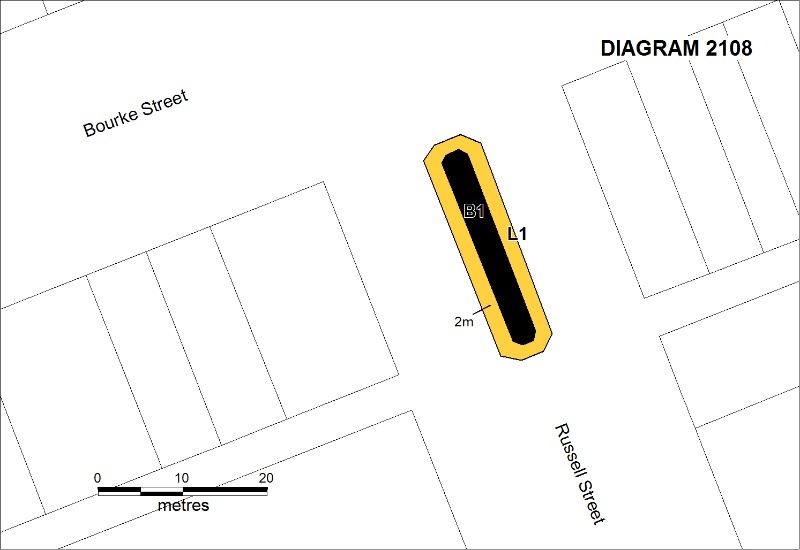 All of the remaining structures on Russell Street, and the original volume of the toilets below ground, are integral to the significance of the place and any alterations that impact on their significance are subject to permit application. The addition of new structures may impact upon the cultural heritage significance of the place. Never knew! Who would of known. Public art installation over the top of the first womens underground public toilet. Shazam!